Syriza’s leadership is operating under difficult conditions. How should we interpret its actions, and what would an alternative look like? That the Greek government blinked last Friday has become increasingly clear. Early reactions of measured support for Syriza’s deal with the Eurogroup have been followed by sharper critiques from the party’s left wing and growing calls for Greece to exit the eurozone, even on the pages of the Financial Times . Perhaps the greatest test came during an internal vote by the parliamentary team of Syriza earlier this week, with roughly one third in attendance rejecting the deal. The leadership of Syriza is faced with a dilemma that nearly all left governments have faced in one form or another: either neutralize the party’s left wing and continue marching down a path of retreat, or take stock of its failures and begin preparing for a more radical break. Syriza has agreed to a four-month extension of the previous memorandum, now renamed the Master Financial Assistance Facility Agreement. Under this deal, the government has assented to having all of its fiscal measures approved by the institutions (previously called the troika — the European Central Bank, European Commission, and the International Monetary Fund) and hence to not roll back austerity unilaterally. The first set of measures largely continues existing arrangements, with the addition of some funds that have now been allocated toward addressing the humanitarian crisis. It should be noted that these funds don’t cover the Thessaloniki Program in its entirety and that, moreover, the party’s previous plan to finance the rest of the program using other European funds is also much less certain now. After all, the institutions have emerged from this first round still on the offensive, with the Eurogroup president, Jeroen Dijsselbloem, remarking that they “wanted to make sure that the . . . money for Greek bank recapitalization is for that purpose, not for recapitalization of the government.” Why would the euro elite change course and agree to funding future measures? What we have, then, is essentially a slightly more humane implementation of austerity. Austerity with some antipoverty measures, coupled with a firmer commitment to combatting tax evasion. As for the minimum wage, pensions, privatizations, trade union rights: these remain to be determined, but at this point, we have little reason to be optimistic. Though much of the language in the list of reforms is intentionally vague, certain sections warrant careful attention. We should remember that the OECD, like the IMF, the World Bank, and other neoliberal institutions, tends to think of such barriers in terms of labor costs, as opposed to structural exigencies like developing the industrial base of less competitive economies. Put two and two together, and it becomes evident that “best labor practices” is synonymous with deepening flexibility in an economy that has already seen collective bargaining agreements altogether terminated. Perhaps where the deal remains most vague is around the issue of debt. The deal includes no amendment to the previous government’s commitment to a primary surplus target of 4.5% by the end of 2016, though the Eurogroup has agreed to take “for the 2015 primary surplus target . . . the economic circumstances in 2015 into account.” And for the 2016 figure, even Dijsselbloem has suggested that there’s possible leeway. But forcing a reluctant statement from its creditors to “consider” an obviously unachievable target is far from Syriza’s original goal to shift the conversation around balanced budgets and renegotiate a debt write-down. The “extend and pretend” logic still remains under this deal. In the meantime, every penny will be scrutinized. The party leadership insists that the deal was the best they could get under the circumstances. Partisans of this view argue that Syriza is buying time to show creditors that they’re capable of carrying out reforms and hence that they deserve more breathing room. Perhaps, even, they’re waiting for more potential allies to come on board. The shortening of the deadline from six to four months, however, makes this even more of a fleeting possibility. August may have been close enough to a possible Podemos victory in the fall, but June is quite distant. And with all other governments having signed off on austerity in their home countries and thus not ready to explain to voters why they should subsidize leniency for Greece, there is literally no one else in the room, including French president and nominal socialist François Hollande, that Syriza can rely on to defect from German Chancellor Angela Merkel’s hard line. Defenders of the deal also point to the very real issue of capital flight. Over $1 billion were withdrawn from Greek banks last Friday alone, in addition to the estimated $20 billion since December. To refuse to compromise would have put Syriza’s leadership in the position of needing to impose capital controls and perhaps even nationalize the banks. This option, of course, would also have increased the chances of Greece’s exit from the eurozone. Why didn’t Tsipras and his inner circle go down this route? Or why didn’t they at least use it as a legitimate threat in the negotiations? There are various ways to interpret the leadership’s actions. The generous interpretation is that they determined that the government still lacks support for this kind of radical break, and therefore the next four months will prove crucial in exposing the intransigency of European elites; building alliances with potential partners like Russia, China, and Venezuela; and publicly discussing other options and building support to that end. The question then becomes: why did Syriza’s leadership fear Grexit more than their lenders? I would argue that this political calculation takes into account the concerns of investors as much as it does those of the ordinary voters who elected Syriza. In the past month, there have been numerous statements of support for or at least tolerance of Syriza by major Greek capitalists, each noting that the party is committed to creating stable investment conditions by keeping Greece in the eurozone. It’s important to parse out what exactly is meant by this. When I made the case earlier this month for a left-developmental approach, I argued that it’s possible for the Greek state to create alliances with a section of Greek capital around a new growth model given their dependence on airwaves, real estate, stadiums, and other domestically based assets; the days of shipowners sailing away when the going gets tough and the economy being left with few sources of investment are over. It is on this basis that a left government could begin disciplining capital and intervening in private investment decisions so as to shift savings to more productive activities. That this scenario is possible, however, does not mean that it is inevitable. And at this point, Greek capital is certainly not looking to shift to a new accumulation regime on its own, let alone exit the eurozone. From the New Deal in the United States to neoliberalism in Chile, states historically have had to either convince or outright compel domestic capitalists to accept economic restructuring. Notable exceptions include transitions that were crafted as the result of corporate mobilization. But as a general rule, capitalists don’t like change, and they rarely initiate it. In that respect, Greek capital at this point would prefer remaining in the eurozone, even amid contraction. Why wouldn’t they? Previous administrations willingly restructured the Greek economy in their favor. The implicit understanding with Syriza is that, though they might attempt to attack poverty and tax evasion, they could also help restore political stability and increase business confidence. That strategy depends on staying in the currency union. But there’s a deeper reason most of Greek capital isn’t inclined to advance an exit plan on its own. Given the weakness of the industrial base, in the short term, devaluation would benefit only a very small number of businesses. The rest of those who stick around would only do so because they had nowhere else to go. This is the basis on which the party could begin intervening in investment decisions. 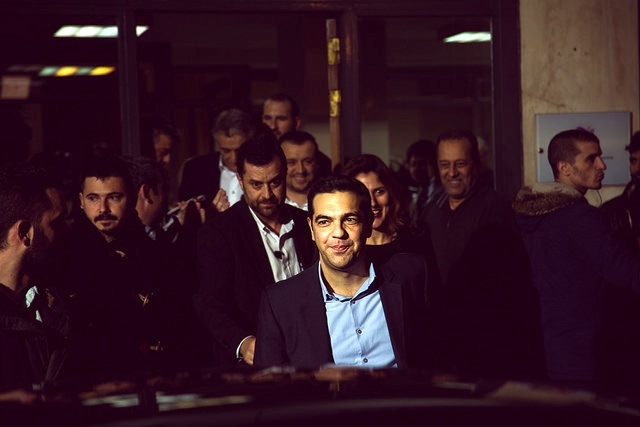 The leadership of Syriza, however, has now shown quite clearly that that’s not their endgame. They gestured at this months before the elections when they said they wouldn’t nationalize banks, and now they’ve demonstrated that they were actually committed to that position. At most their plan for disciplining capital entails taxing it, which would be a major change given the extent of tax evasion but still not enough to forge a truly anti-austerity politics. This, then, is perhaps the clearest lesson from Friday’s deal: reversing austerity will require confronting political and business elites, both foreign and domestic, head on. Kouvelakis and others in the left wing of Syriza, including Lapavitsas, Resistance hero Manolis Glezos, and Energy Minister Panagiotis Lafazanis — and even members of the dominant faction, including one of its key economists, John Milios — have suggested that the party has reached a new phase where strategic debates must be revisited and revised. And they’re right. It’s time for Syriza to consider and actually substantiate a Plan B. What might this plan consist of, and how could the leadership be pushed to embrace it? The most extreme Plan B, of course, is Grexit and the attendant short-term measures, including bank nationalization, capital controls, controlled devaluation, and appropriate rationing of food, pharmaceuticals, and fuels. In the long term, to make this plan work and to convince people that the immediate consequences are worth it, the government would have to be very proactive and strategic in forging a set of alternative trading partnerships and industrial policies. Enforcing such a Plan B would require, in other words, a plan. But there are other steps the government could take in transitioning to this scenario. It could begin imposing capital controls prior to an exit. It could introduce a parallel currency. It could continue to vie for a debt equity swap. These are, of course, unilateral actions that would most likely induce the institutions to force Greece out of the eurozone, but this is precisely the counter-threat Greece needs to pose. Perhaps even more importantly, these are actions that would require Syriza to not simply court capital in order to get its support, as party leaders have done until now, but to force capital to accept a new growth strategy. If the party does not reorient its relationship to domestic elites, this will remain one of its largest blind spots. For any of these ideas to even be entertained by the leadership, a major battle will have to be fought within the party. Until now, the Tsipras team has been moving ahead largely without consulting their comrades on the central committee. This was partly inescapable: the time constraints of the negotiation prevented extended deliberation. And during the first month, even the left wing of the party was willing to give their leadership some space until a deal was reached. At the same time, this dynamic is a continuation of what was established in the two years the party was preparing to take power. At this point, as Kouvelakis suggests, we should expect a reassessment of the current “good euro” strategy, which can only occur if the party’s leadership is compelled to redemocratize their internal processes. Thus far we have seen quite a few members of the party publicly declare their frustrations. That one third of the parliamentary team has rejected the deal in an internal vote must not be taken lightly. As a result, a central committee meeting is being held today instead a parliamentary vote on the deal, which has been postponed for now. We can expect these debates to become increasingly more public, especially as popular disappointment escalates. And here’s the key. There will have to be a fight not only in the party but in the streets. These two struggles are necessarily connected. As it becomes clearer that public sector workers won’t be rehired, or that mass unemployment won’t be alleviated, we might expect an uptick in popular mobilizations. But that ultimately depends on the extent to which left forces project hope and offer a clear alternative. In other words, there must be a high level of popular education accompanying mass demonstrations in this next period. It is time for the Left to deepen the themes of radical democracy that were so prevalent during the Syntagma occupation and in its related neighborhood assemblies. Much of that task includes addressing people’s very real fears about more radical breaks. That the elected representatives of Syriza and its popular bases lie to the left of the party leadership is a very heartening sign. It is on them and on other forces of the Left to facilitate discussions where questions about capital flight, currency devaluation, rationing of basic goods, trade partnerships, and even the longer-term prospects of disciplining capital are raised, deliberated, answered. It is only under conditions where people are informed and inspired, where they feel as though they’re not leaping into the dark, or at least that there are concrete ways of navigating it together rather than around it in fear, that any alternative could work. Of course, the constraints and stakes are massive. There is seemingly little to be won and much to be lost. But at this point, few are under any illusions that either reversing austerity will be easy or that the status quo can be tolerated much longer. The Greek voters themselves perhaps know that better than anyone else. Nantina Vgontzas is a sociology PhD student at New York University. She is a member of the UAW Graduate Student Organizing Committee and is involved in the Academic Workers for a Democratic Union reform movement.